Classic static telephone booths are slowly fading from the urban landscape but talking on the phone has never been more popular. 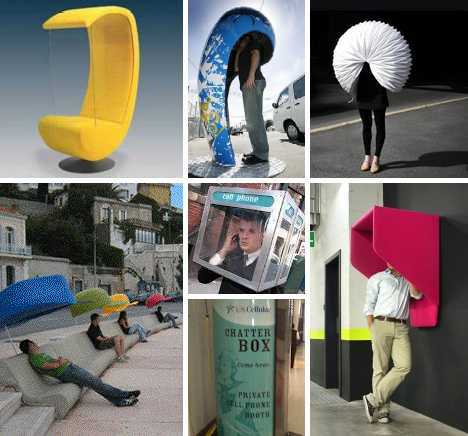 These 12 concept mobile phone telephone booths attempt to recapture the personal isolation those old public phones provided while enhancing the experience of conversing in the city. 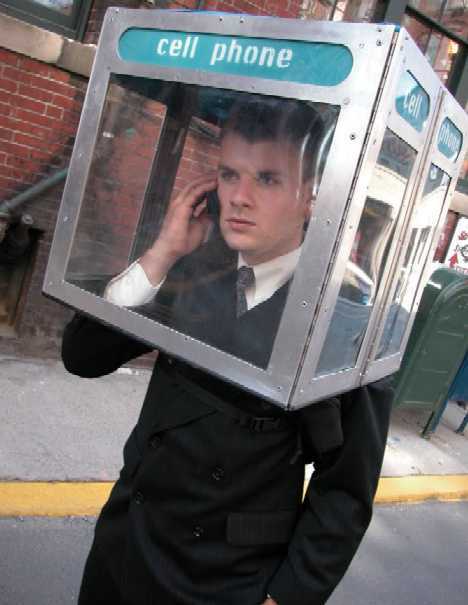 No discussion of portable cellular phone booths would be complete without the Portable Cellular Phone Booth, a one-off “sculpture” crafted from stainless steel, aluminum and polycarbonate. Though it dates from 2002, Rodrigues’ art object perfectly captures that pivotal moment in societal history when mobile phones began to nose landlines out of the picture. 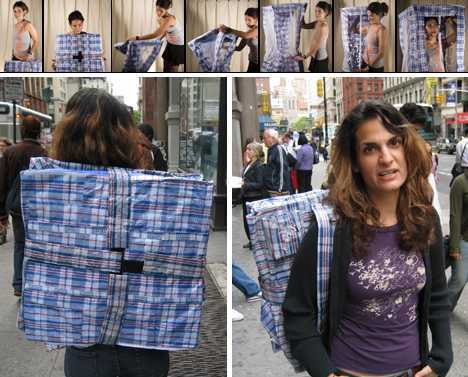 Measuring 16″ X 24″ X 36″, the device collapses down to flat-pack dimensions and can be worn on the user’s back much like a backpack or rucksack, only harder and heavier. When a call comes in, simply unfold and insert one’s head – and try to ignore the amused, bemused and confused stares of onlookers. The Silence Chair from Finnish designer Antti Evävaara offers mobile phone users a comfortable personal space within which to chat. 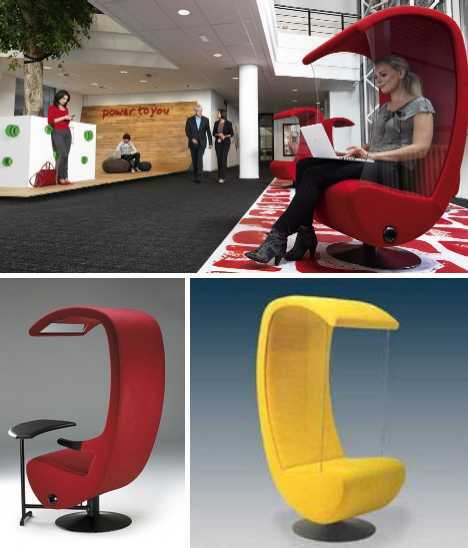 At the same time, the chair’s safety glass side panels ensure the sound of the conversation doesn’t intrude upon others. 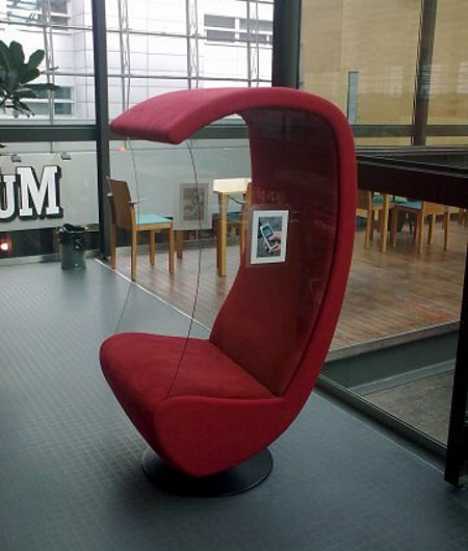 Available in up to 67 different colors spread across a range of 6 different styles, the Silence Chair is designed for use in airports, lobbies, lounges, meeting rooms and libraries – the latter is the scene of the image above. Note the sticker on the side glass indicating the suggested use as a cell phone communication station. The Hush Cone, designed by Miles Thornley of Brown Kiwi, re-imagines the classic outdoor public phone booth for 21st century modes of mobile communication. 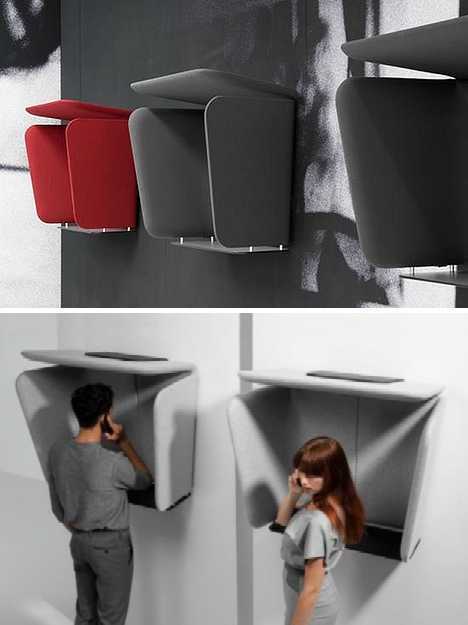 While dispensing with the pricey wiring and the landline phone of old, the organically shaped fiberglass booth maintains the sense of visual and acoustic privacy that mobile phone users often find missing in urban environs. The Cell Atlantic CellBooth (the name is a throwback to the good old days of Bell Labs) from artist Jenny L Chowdhury takes Nick Rodrigues’ personal phone booth concept and lightens it up a little. 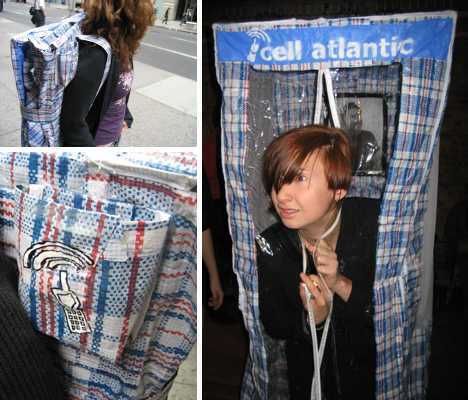 Like Rodrigues’ blocky booth, the Cell Atlantic CellBooth is worn knocked-down on one’s back but easily unfolds when a call needs to be made or taken. The insta-booth employs so-called “Third World Samsonite”, that plaid, stiff & shiny pseudo-fabric usually seen lining wheeled pushcarts sold from dollar stores. 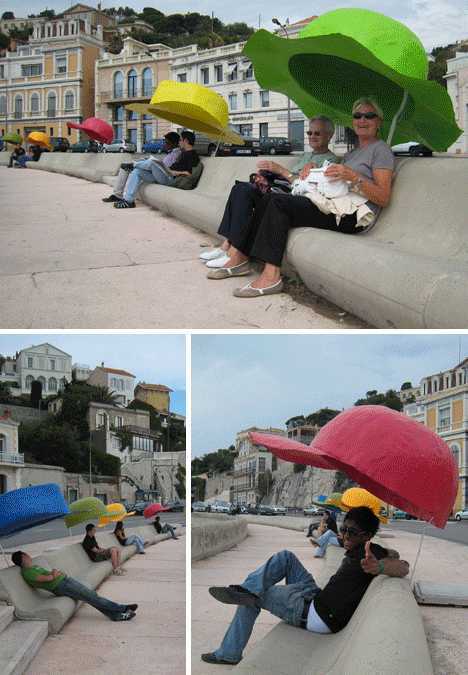 The fabric is light, tough and resists water in case the user’s caught outdoors in stormy weather. Phone booth meets fashion? 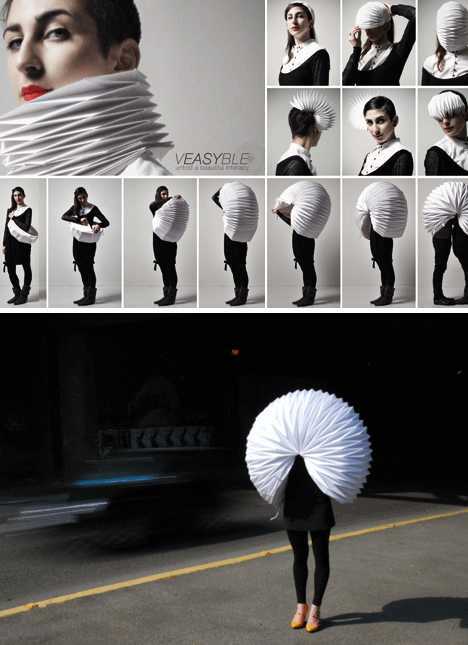 The Veasyble (with the emphasis on the “easy”) designed by Gloria Pizzilli, Arianna Petrakis, Ilaria Pacini and Adele Bacci appears to be an attempt to make the accordion cool again, assuming the accordion was ever cool that is. Combine it with Pac-Man and you’ve got a polyethylene, paper and fabric isolation chamber than can be shared by two in a pinch… ouch! You can knock down the traditional wall of telephone booths lining the walls of busy train stations, airports and the like but travelers still need a place to make their mobile phone calls. 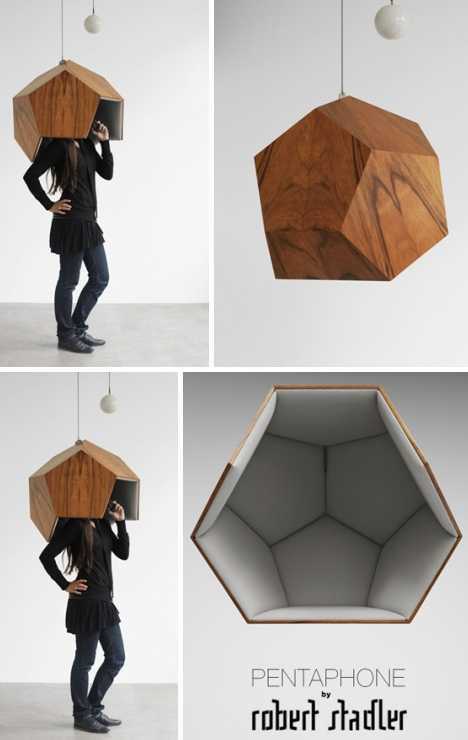 Enter Mathieu Gabiot’s Prooff PhoneBox, a truncated version of the old-style full length booth that serves basically the same purpose: providing a sound-sheltered environment where one can hear and be heard. Described by its makers as an “Acoustic Mobile Phone Booth”, the Prooff PhoneBox can be mounted singly or in ranks depending on the site and situation. It economical design focuses on the small space around the caller’s head: that’s where the speaking and listening goes on, after all. 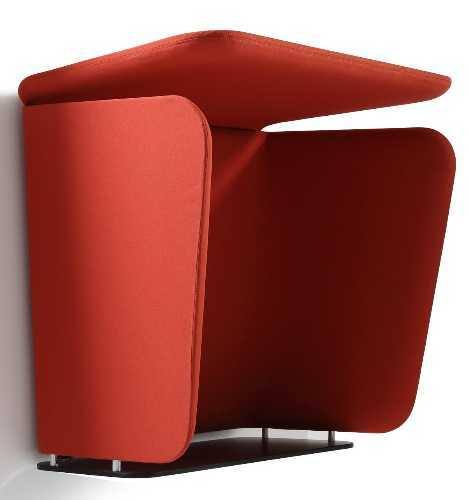 Austrian designer Robert Stadler conceived the Pentaphone as a vertically adjustable isolation space that doubles as an intriguing piece of indoor furniture. Crafted from stained and varnished wood panels lined with acoustically absorbent foam, the Pentaphone may look more than a little sci-fi but why not? It’s hard to get any quieter than being in outer space. Is it a stretch to call Corniche des Chapeaux a mobile phone booth? Perhaps, but let’s just keep it under our oversized hats, shall we? 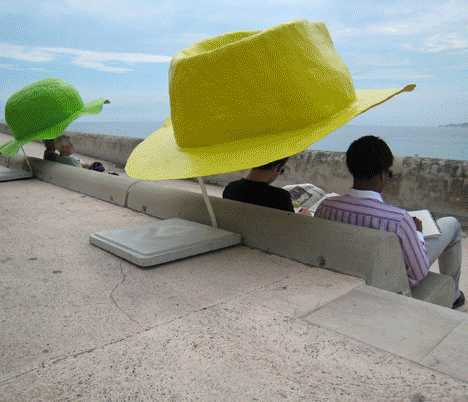 This collaboration between artist/designers Benedetto Bufalino and Victor Vieillard saw a series of colorful hats line the waterfront of Marseille, France, in June of 2007. 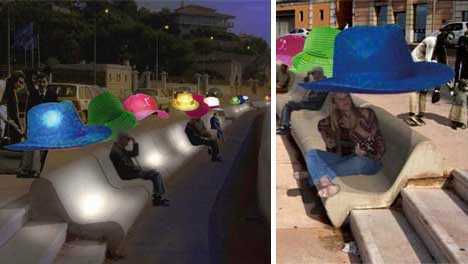 Besides serving as cozy, convenient spaces for mobile phone communication, the hats functioned as sunshades during the day and reading spaces by night thanks to integrated lighting. 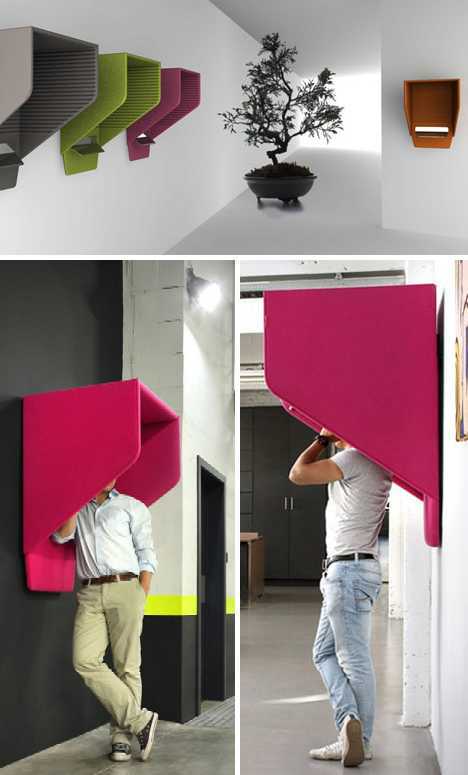 Designer Alain Gilles has come up with the Mobile Phone Booth, a wall-mounted personal space similar in many ways to the Prooff PhoneBox. 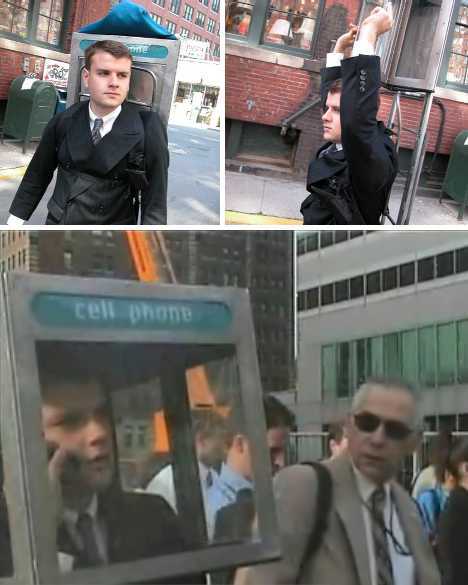 The Mobile Phone Booth is larger, however, and includes an integral inner shelf to rest one’s communication device of choice… or one’s arm. 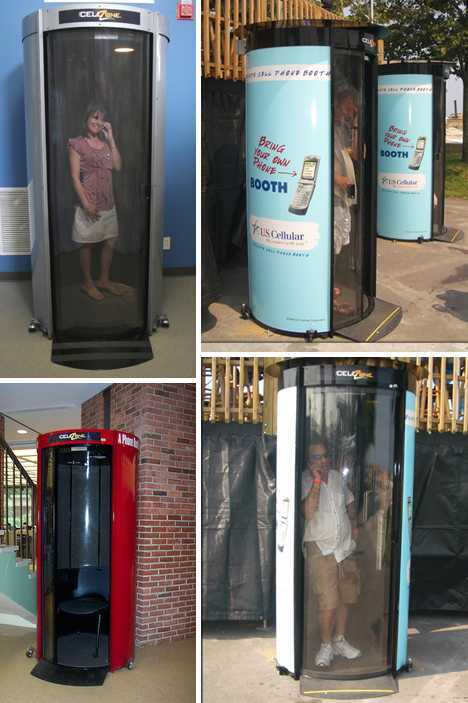 The CellZone “Bring Your Own Phone” Cell Phone Booth from Salemi Industries looks a lot like the traditional telephone booth it’s meant to replace. Coincidence? 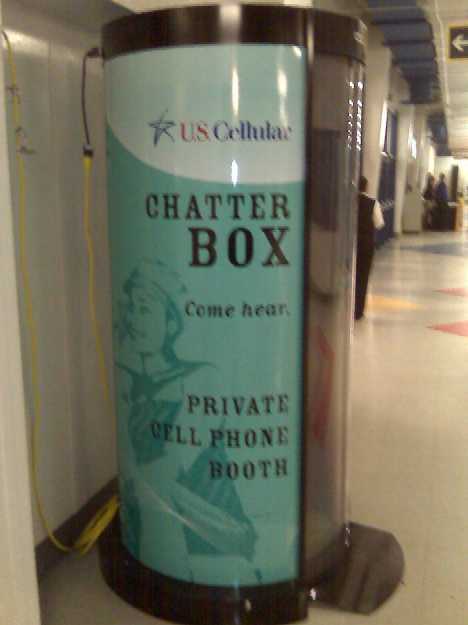 We think not – and neither does US Cellular, who’ve seen fit to install a few CellZones (renamed “Chatter Box”) at US Cellular Stadium… where else? The cylindrical, transparent-doored booths look a little like those message capsules used in pneumatic tube delivery systems but not to fear: you won’t end up like a Futurama character should you step inside one. On the contrary, you’ll stay put but your mobile phone messages will do the traveling for you. 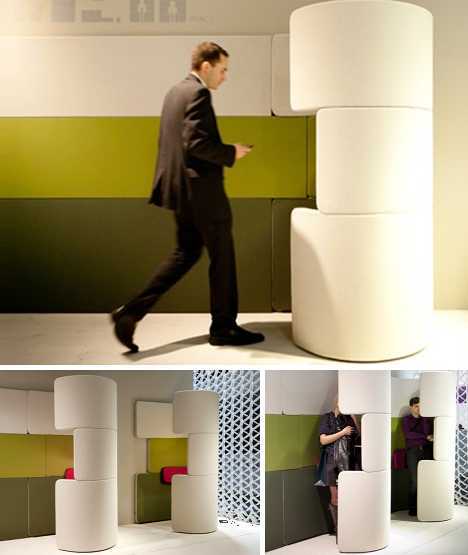 The PARCS Phone Booth is a mobile office partition designed by PearsonLloyd. Functioning as an acoustically and visually shielded private space within public areas, the PARCS Phone Booth creates a head-to-toe sonic cocoon that offers silence to both the user and those who work nearby. 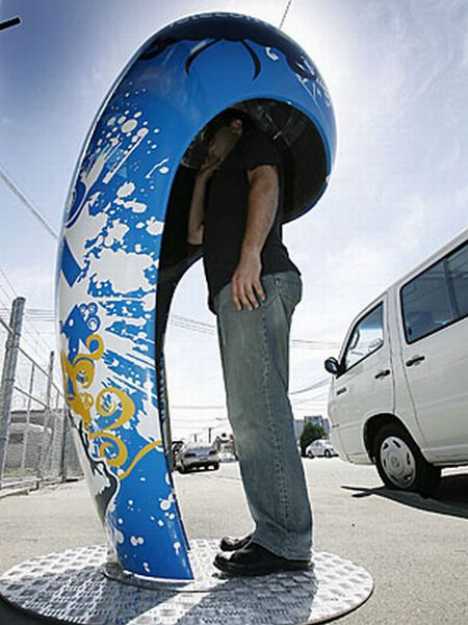 Designers of mobile phone booths have shown they’re long on creativity but short on practicality – a forgivable foible, as the concept of creating space for mobile conversations is mainly untested in the real world… or is it? 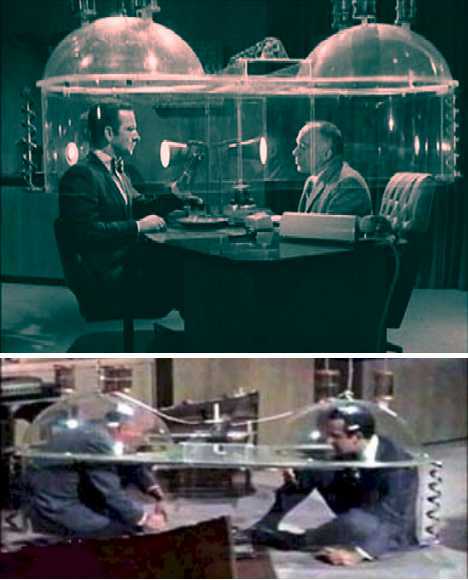 The classic 1960s spy comedy Get Smart featured the Cone of Silence, an awkward and ineffective acrylic double-bubble affair meant to conceal top-secret conversations between Maxwell Smart and the Chief of CONTROL. 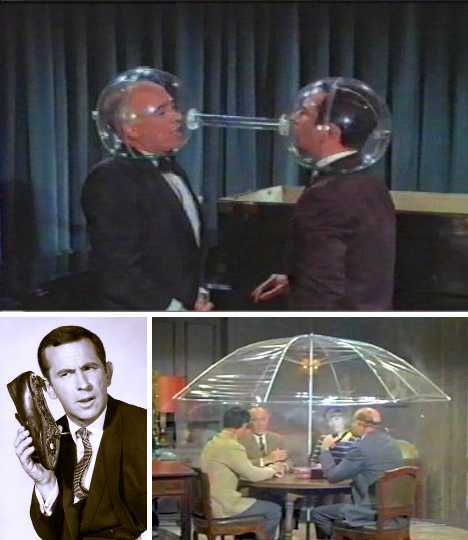 The flawed device was also available in a portable version for two and the “Umbrella of Silence” for groups. An idea ahead of its time? Perhaps, and not the show’s only one… Agent 86’s preferred mode of mobile communication was his shoe. “Smart phone” indeed.